Crypto Zoo is one of the animal-themed microgames featured in Kat and Ana's stage in WarioWare: D.I.Y. Showcase. It returns in WarioWare Gold as one of Orbulon's microgames. Its title references the field of cryptozoology. The screen displays tiles of animal body parts. The player must change the tiles, to make them match. 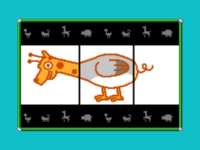 The game is won when the tiles match and make a full animal body. In DIY Showcase, the animals are a giraffe, cat, bird, and a pig. 1st level difficulty: Two of the tiles match from the start. The animals are an aardvark, a goldfish, and a pig. 2nd level difficulty: None of the tiles match from the start. The animals are a cat, a camel, a chicken, and a sheep. 3rd level difficulty: None of the tiles match from the start. The animals are a bird, a zebra, and a jaguar. 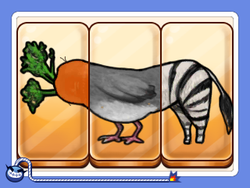 There is also a carrot, which does not complete the microgame if formed. This page was last edited on December 17, 2018, at 20:00.